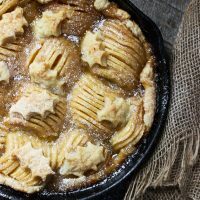 A delicious and Rustic Skillet Spiral Apple Pie, with a brown sugar and butter filling and decorated with pie crust leaves. 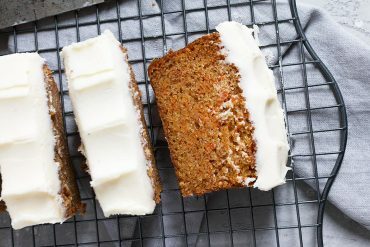 Perfect for Fall or Thanksgiving! I did actually make my own pie crust here, but totally no judgement for anyone who wants to make use of the handy, dandy store-bought version. You’ll need two if you want do the leaves on top. If not, just one for the base is fine. I just used a leaf-shaped cookie cutter to cut some leaves from my extra dough and scattered them on top before baking. As for the spirals, the easiest way (and what I used here), is to use one of those apple corer/peeler/spiralizing tools (Scroll down for more info on those!). I feel like a lot of people might just have one of these in their kitchen, but if not, you can easily grab a knife and get it done. I’ve detailed that option in the recipe below. What are theBest Apples for Pies? Northern Spy apples are the holy grail of pie apples, so if you can get your hands on some, they are perhaps one of your best choices. Other great options for pie apples are Cortland, Ginger Gold, Golden Delicious, Honeycrisp or Mutsu (Crispin), Jonathans and Jonagolds, Granny Smith, Melrose, Winesap and Braeburn. 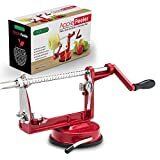 This is the exact apple peeler/corer/spiralizer tool that I have. 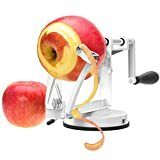 It’s less than $20 and makes the job of peeling and coring apples a breeze. 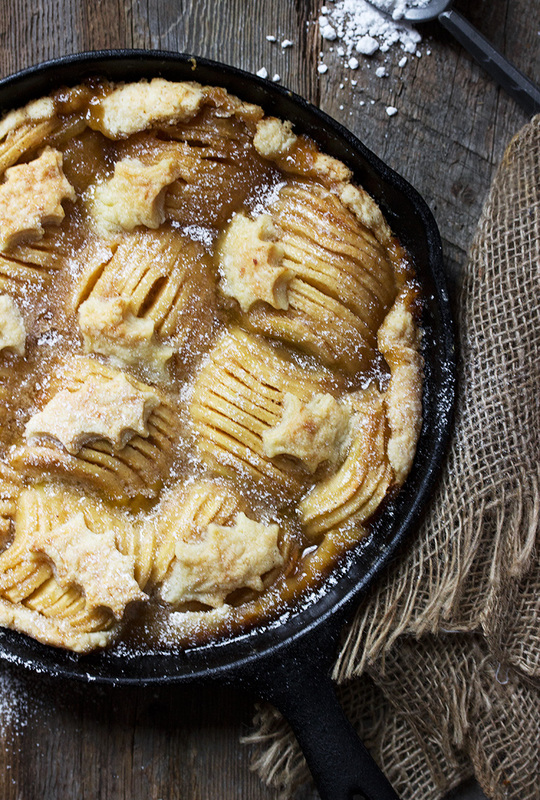 Rustic apple pie, with a delicious brown sugar and butter filling and pretty dough leaves scattered on top. 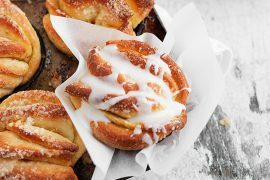 You can use your favourite homemade pie dough or store-bought. You only need one for the pie. Make or buy extra if you'd like to cut some dough leaves. Prepare the apples: If using a peeler/corer/spiralizer tool, prepare 4-5 apples, then cut in half from top to bottom, making two halves. If doing by hand, peel apples then cut in half from top to bottom. Use a teaspoon to scoop out and discard all the core. Lay apple half flat on a cutting board and use a sharp knife to cut in to thin, even slices. Keep each sliced half-apple together and place as one group in the pie. In a small saucepan, melt the butter over medium heat. Add the flour and stir to form a paste. Add the water, white sugar and brown sugar and bring the mixture to a boil. 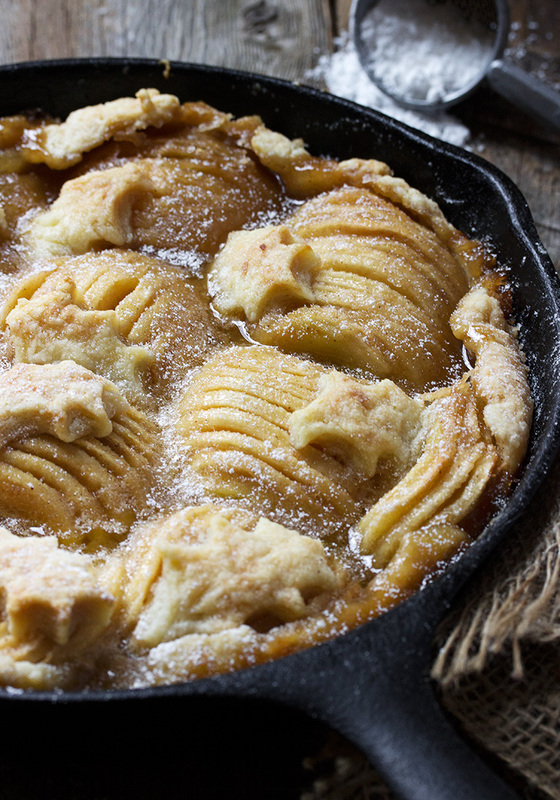 Reduce heat to low and let simmer while you prepare your pie. Meanwhile, grease skillet and place the bottom pie crust dough in, coming up the sides to the top. Brush bottom of dough with egg white. Arrange apples over the crust, cut side down and varying the direction with each one to make a nice patter. Place as many halves as you can fit perfectly flat. Cut a few in to smaller pieces to fill in any large gaps. Pour the sugar and butter mixture over the apples. 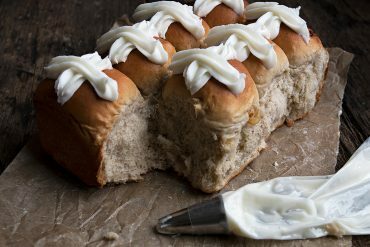 Fold any excess dough on the sides inward. If making leaves, cut several leaves out of extra pie dough using a cookie cutter. Scatter over top here and there. Brush the leaves and top outside edge of the crust with the reserved egg yolk that has been lightly beaten with a splash of water. If desired, sprinkle with a bit of turbinado or white sugar over the dough edge/leaves. Place pie on a baking sheet to catch any overflow. Bake for 50 - 55 minutes in the pre-heated oven, until apples are soft when a sharp knife is inserted. You may want to check near the end of the cooking time and cover the pie with aluminum foil to prevent the crust from browning too much. This pie was delicious. I have never made a brown butter sauce to pour over the apples. Reminded me of butter tart filling. I made my pie in a traditional pie plate and my family commented that it was the best pie I have made and I have made many pies over the years. I added a firm red pear to the top and then dotted with cutouts of leaves and apples. There was only a small piece left and as someone commented earlier a great breakfast item with a cup of coffee. What a scrumptious pie! 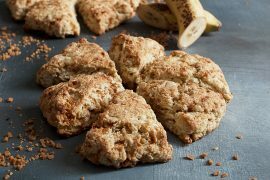 This is exactly the type of dessert that I love – and leftover always become breakfast :). I am in awe of this, Jennifer. I haven’t been able to satisfy my cravings for apples this fall but I think this would finally do it. Stunning! I’d drive all the way to your place for a single bite, haha! Thanks Robyn :) I never tire of apples, especially in baking! I wouldn’t call you pie challenged Jennifer. This pie is gorgeous and I love that it’s got lots of apples and not as much crust as most pies. Love your leaf decorations too. I just want to reach in, pull one off and pop it in my mouth. 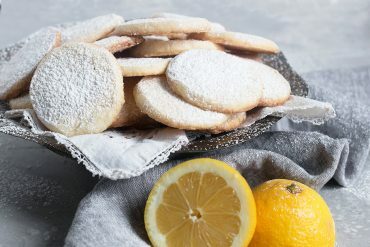 They look super flaky and crisp! 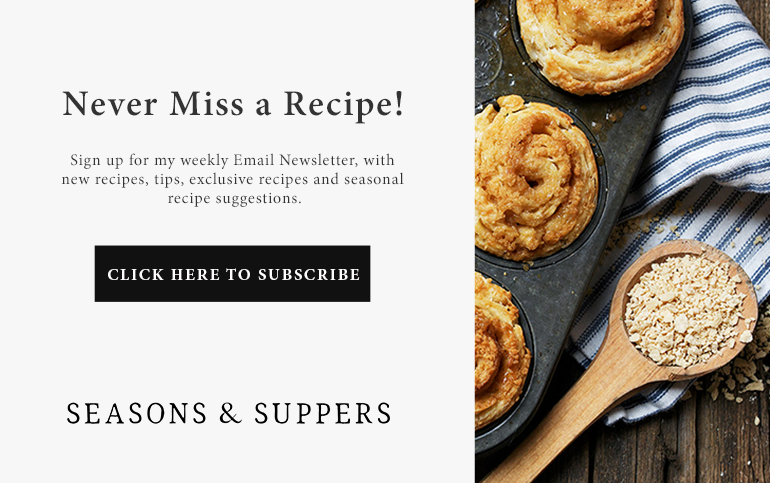 Thanks so much, Chris :) I am getting a bit better at the whole pie crust thing since I’m actually making myself do it, rather than avoiding it (which I did for years!) As I said, I love to eat pie, so I’m highly motivated to conquer this one. 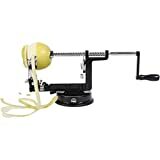 What a great twist (no pun intended) to use a spiralizer for the those apples. Makes for such a pretty presentation. And anything in a skillet!! Especially pie! I do love my pies, can’t seem to get enough pie in my life….my waist will NOT agree with that fact…LOL!! 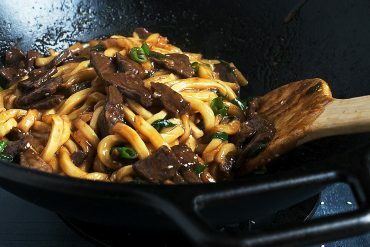 I am definitely going to make this beauty and lucky me I do have an iron skillet. Also, I made your Apple, Mushroom and Sage Risotto, it was a hit with friends! Have a nice day Jennifer! Thanks Dalila and so glad to hear you enjoyed the risotto :) You will love this pie. Absolutely perfect warm with a bit of ice cream! Have a great week. I’m pie challenged too Jennifer! 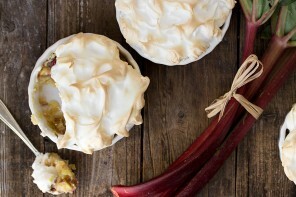 So this rustic pie is TOTALLY up my alley! It looks beautiful and I bet tastes just as delicious! Thanks so much, Mary Ann :) I suspect there are a few of us in that club! 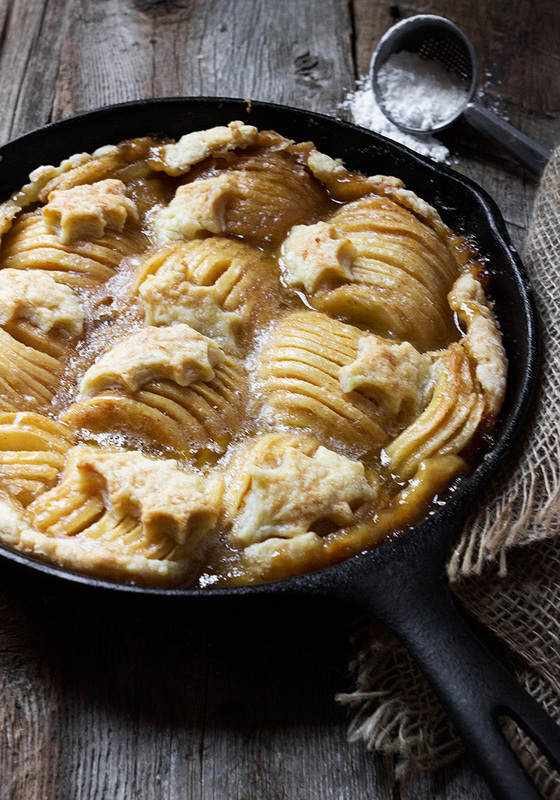 Oh my gawsh, I am SWOONING over this rustic pie, Jennifer!! 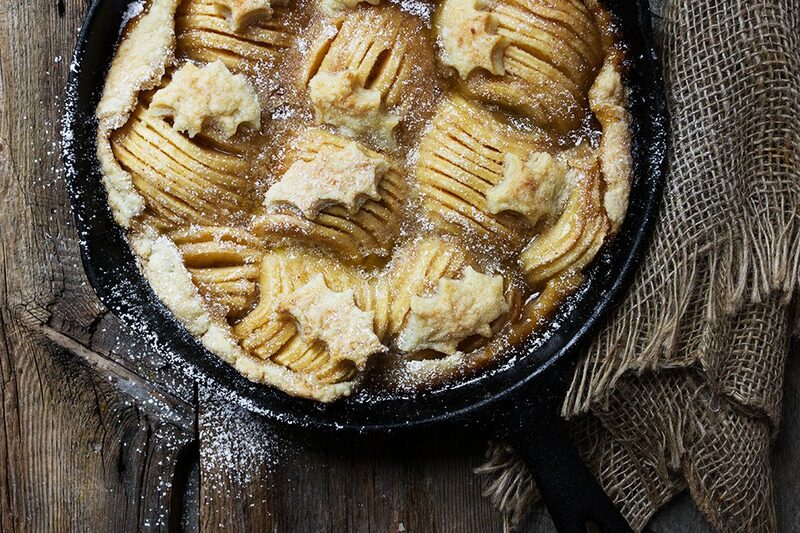 Love that you made it in the skillet and those apple spirals and pie crust leaves are just so pretty! 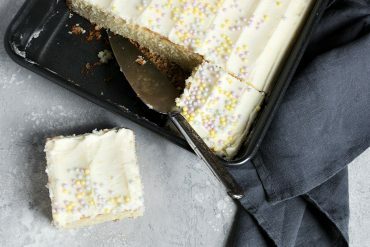 I could totally go for a slice or seven of this for breakfast right now! Cheers! I could use a big scoop of that for breakfast right now, stunning Jennifer!